One of the little things that I enjoy in life is to decorate my work and my notes with cheerful colors. I wouldn't take a lot of effort to spice up my notebooks and papers, but I try to incorporate it effortlessly into my daily life. For instance, instead of using black and blue pen all the time, I mix up my writing with colored ink. Of course, those would be the stuff that I keep for my own use and reference. If it's something that's gonna be read by others, I'd stick with the conservative black and blue. 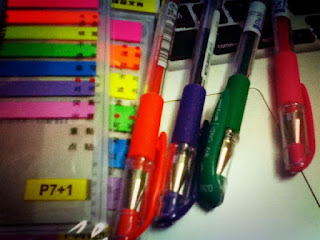 I also love to use colored post-it flags to tag my notes, and people around me are always amused at the number of colors I use for highlighters. I have all 6 basic hues- pink, blue, purple, green, orange and yellow- and I always color-code my notes accordingly. It's a good way to get organized. I confess that I'm very particular when it comes to keeping track of what I've done, thus my records are always well categorized by color. It may look confusing to others, but for me it's a breeze to sieve out the important point and find what I need. And hey, it's a great way to brighten up my day, literally. I feel chirpy and happy just by looking at pink and orange fonts!